Coffee lovers, your time has come. Picture a world where someone can make your coffee exactly as you like, every time. Picture a world where you’re not waiting in some slow-motion tango line in a cramped cafe, wondering if Jane Doe stole YOUR cappuccino. Picture a world where you can calmly and peacefully specify your caffeinated work of art, and you know precisely how long you’ll have to wait until you can enjoy it. Picture a world where life happens and you can’t pick up that coffee you ordered, and the only response you receive is a benevolent wish for a good day and a refund of your money. Picture a robotics-infused coffee Haus. Optimization is the name of the game for Austin-based startup Briggo, and Founder/CTO Charles Studor and Co-Founder/CEO Kevin Nater are ready to begin the grind in earnest. With decades-long experience in the semiconductor, business, technology, and financial services industries, these visionaries began their entrepreneurial journey by bringing a unique background to the coffee industry, one that’s apparent in their entire approach to creating both Briggo and its specialty coffee. As Nater recalls, “Chas told me an idea which was both astonishing and outrageous. He said, ‘let's build an automated system that is literally the IoT of coffee--an internet connected device that's fully web enabled and allows each of us to have our personal, perfect coffee experience.’" What’s even more astonishing is that they’ve done exactly this, and they’re ready to fundamentally change how the everyday person enjoys coffee. Briggo is the disruptive wave of the future, or at least it plans to be at an airport, college, hospital, or office campus near you. 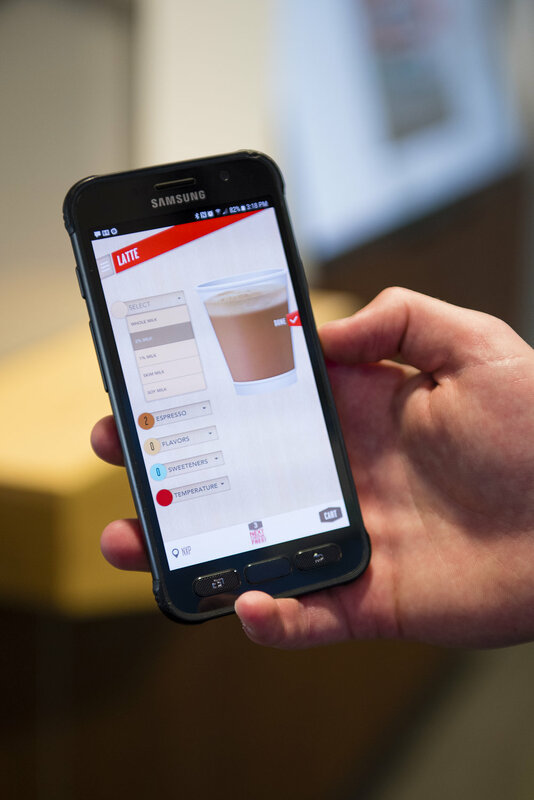 With successful pilot launches at the University of Texas and at Dell, Briggo has conducted an iterative process of refining their three-pronged product: consistent expert coffee, a user-friendly interface, and the robotically-operated Coffee Haus. A seamless fit is not the only priority for Briggo. One of their core principles and value proposition is to drastically reduce the waste, inefficiency, and inconsistency that can arise in people-powered cafés, such as counter-confusion and employee turnover. 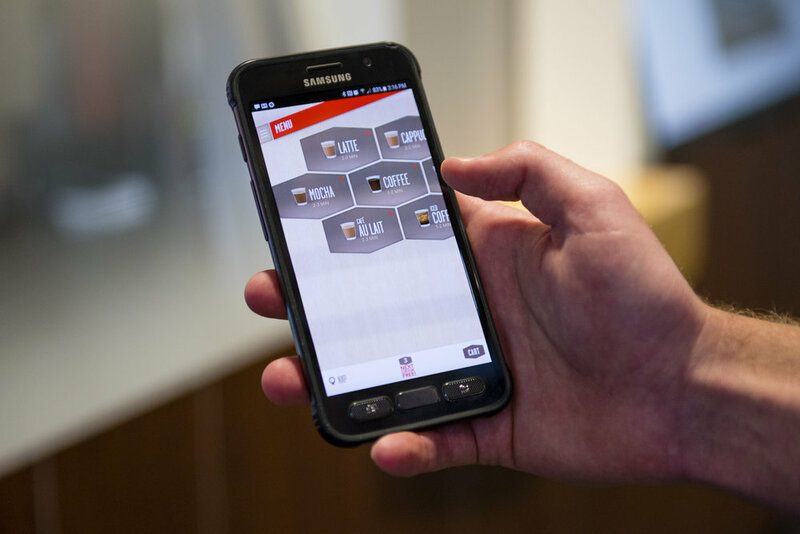 Training or recollection is not an issue because the machine will know right away how to make the desired drink, and it will have your exact preferences stored and at the ready. This philosophy extends even outside of the small footprint of the Coffee Haus. With compost programs and beans that are carefully sourced from Latin American farms, many of which are family-owned and dependent on the coffee bean industry, Briggo is passionate about creating a line of efficiency that allows them to directly contribute to the people that originally inspired Studor to create the innovative Coffee Haus. Studor and Nater’s passion to reduce waste and give back is not a late-in-the-game concept; rather, it’s a fundamental part of the original and beautifully simple inspiration for Briggo. Studor, who was in the midst of his 25-year career in the semiconductor industry, had made several trips through the early 2000’s to a small community in Honduras for nonprofit development work. After ending his work at Motorola as the head of a large chip design organization, Studor returned to Honduras to help design and build a school. In the midst of his travels, he became focused on how the people in that community made coffee. “Where we were, they made coffee in a clean cotton sock. They put the coffee in and then pour the water through the sock and watch this dark, black, beautiful stuff come out. The moment it went from jet black to not jet black, they would very precisely remove it from the pot and throw it away,” he recalled. Once it was mixed with hot water, the authentic coffee experience was complete, sock and all. The Hondurans’ exacting movements and complete focus left a lasting impression on Studor, an impression made all the more stark by the raw simplicity of their tools. “There must be a really precise process that would cause these people to focus like that," Studor remembers thinking. The concept of process is not only fundamental to the creation of a company and product like Briggo, it’s a way of thinking that’s inherent to the minds and backgrounds of Studor and Nater. “If it's a process, it's obviously very critical,” says Studor. The duo believe that if there is a better way to get consistency and reduce waste around a process, it is essential. It’s a frame of thought that has been the fuel in their journey to create each customer’s perfect cup of coffee, every time. “If you take care of the entire process,” Nater believes, “then you can really deliver an exceptional experience." In part, that methodical way of thinking and creating is what brought the pair together. Years after Studor’s time in Honduras, the recollection of that careful brewing process lingered. After leaving Motorola, Studor decided to investigate the restaurant business. Even before he and Nater decided to become entrepreneurs, however, one of their pillars for entrepreneurial success came into focus to guide Studor. “You have to know yourself,” Nater advises, and fortunately for the pair, Studor had enough self-awareness to follow that wisdom. “I realized the restaurant business was not me, particularly the inevitable wastage, training, and inconsistency.” As he chose against the restaurant industry, Studor decided to give more thought to that precisely-made cup of coffee. The thought became an idea, one that Studor nurtured with research and spreadsheets and prototypes from 2005 to 2008. It was at this point that Nater & Studor’s second pillar of entrepreneurial success emerged: listen to people, and ask for advice with a discerning measure. “I looked at the quality of the person first, before I asked for the advice,” Studor said. “I knew before I asked them about their business and their principles, and I had a sense that this is someone whose advice I’d listen to.” This behavior led Studor to talk to a dad at his kids’ school whose principles and business background he admired. “I didn't have the business background,” Studor recalls. “I understood that maybe [Nater] could help me figure out if my idea made any sense or if I should stop doing this.” As we know now, Nater didn’t tell Studor to stop. Nater, who brought a multi-decade background in the business, technology, and financial services industry, including being the President and CEO of Dell Financial Services, saw that the coffee industry substantially lacked automation compared to other industries. “Here was a case where we could take cost out of a process, increase the customer experience, actually create something really wonderful,” Nater explained. The hard work began, and the pressure as well. With established careers and families at home, it was a pivotal time to make the jump to entrepreneurship, but it was one they each knew they needed to make, for their families and for the lives they wanted to lead. Adding to the situation was the timing—2008 and the economic downturn. Fortunately, the impact on the coffee industry wasn’t significant, and people’s interest in quality coffee was on the rise. “Environmentally, you had an economic condition that didn't really necessarily allow for big companies to track differently, but coffee had a consumption pattern that was pulling more and more on quality,” explained Nater. The trend was ideal for a specialty coffee company, so Nater and Studor began building the machine as they pulled funding from through their personal savings as well as friends and family. As credibility grew, they were able to receive funds from larger institutions, but venture capital support took time. A key step they took in the process was to talk to investors early and maintain the relationship. “You have to make those calls,” Nater advises, “even when you know it’s early. Find the two or three folks who will invite you back for a second meeting, even though you know they're not going to fund yet.” It’s this wisdom that enabled the duo to receive VC support. They also recommend drinking coffee: high quality, consistent, and with all the efficiency a person would need, entrepreneur or not. Stay up-to-date on the latest innovations by Briggo by checking out their website, briggo.com to see when you can get an automated cup of coffee near you.